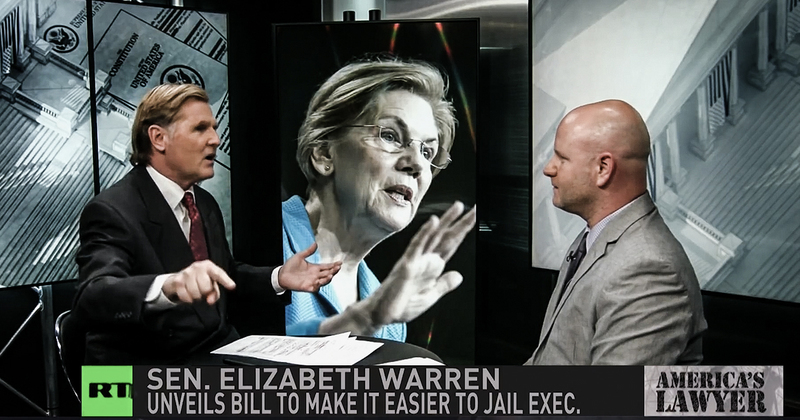 Via America’s Lawyer: Mike Papantonio and Trial Magazine Executive Editor Farron Cousins discuss Elizabeth Warren’s efforts to throw corrupt corporate CEOs in prison. Mike Papantonio: Presidential candidate, Elizabeth Warren, wrote an op-ed recently saying that we need to change the rules to make it easier to throw CEO’s of corrupt companies behind bars. Makes perfect sense. You and I have talked so many times, you can’t slap the CEOs on the hand, make the stockholders pay a fine. The fine means nothing. It’s a cost of doing business. Taxpayers end up footing the bill on the fine indirectly. You understand that, right? Because they claimed the fine as a tax write off. So as I look at this story, again, I say I love this woman and I wish she could build up more steam in her campaign. I’m really disappointed that the donors aren’t coming in. I’m looking at this. This woman is just perfect. Go back and look at the list of things. I mean this list tells a story. Jail CEOs who commit crimes. They don’t look like criminals because they’re dressed up in suits, but they’re criminals. 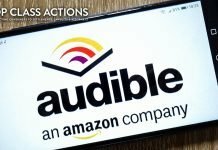 Break up the tech companies, Google, Amazon, Facebook. Break up Wall Street banks. All of these things she’s talking about are great ideas. This woman is tough, willing to push back, a great campaigner, great speaker, and a great thinker. What’s your take? Farron Cousins: Absolutely. And with her plan now, she actually ended up introducing legislation that is going to make it easier to put these CEOs behind bars and it’s a very simple concept, and it’s something you’ve been talking about throughout your entire career actually, is looking at these documents and seeing in these cases that the CEOs, the higher ups, they know most of the time that these kinds of things are happening, whether it’s the mortgage fraud, the robo-signing, opening up the fake accounts. It goes to the top and she wants to put those people in jail, because that is criminal activity, instead of making them pay a fine, which most people also don’t realize typically doesn’t even get paid in full. They pay about 50 to 75% of it and then write off 75% of that. Mike Papantonio: Let me tell you, this woman is brilliant. I like everything about Elizabeth Warren, and she’s going to overcome the whole Pocahontas thing. It’s nonsense, but what she’s saying here is look, if a company is doing more than a billion dollars in revenue, and if the decision of that CEO, if we can show by documents, which I’m telling you every case I’ve ever handled against pharmaceutical companies, environmental polluters, Wall Street types, there have been dozens and dozens of documents that tie the conduct right up to the top, but the DOJ, again, has always lacked the guts to go after that CEO because they’re afraid of the political fallout. They say, oh, well we can’t get a conviction. Nonsense. A good prosecutor can get convictions against these people all the time, and that’s what she saying. Everybody should read this Washington Post op-ed by Elizabeth Warren. It’s brilliant. It’s simple. And, and the truth is, if I’m looking at this field of candidates right now, you know how I support Bernie. You know, I’ve been a Bernie supporter for a long time. I’m looking at realism right now. This is the candidate, and unfortunately she’s just not getting the kind of ground swell that she needs. Farron Cousins: It is very bizarre that she does not have more support. She has the huge name recognition, even more so than Kamala Harris, and she has the most comprehensive platform with policies and even in some cases, step by step directions on how she’s going to do this thing but this one idea, I got to say, is by far one of the best political ideas I’m ever seen. Mike Papantonio: Put them [corrupt CEOs] in jail. That changes culture. I don’t care if they’re a Harvard MBA, I don’t care if they drive a Bentley, whether they’re dressed up in an Armani suit, if they’re a criminal, they’re a criminal, and you got to treat that criminal just like you did the kid on the street who selling three ounces of marijuana. Farron, thank you for joining me, Okay.